Can you tell me about your background? Did you grow up in the Netherlands? I was born in the Netherlands but my parents, siblings and I moved to Canada when I was almost seven years old. I grew up in central Alberta, in a region full of Dutch immigrants! As you probably know, if Dutch people go to church, it’s usually to a Reformed church. I grew up attending a Christian Reformed church where a lot of other Dutch farming families attended. The reason this interview came about was because I heard that when you were growing up, there were two constants in your home on Sundays: soup and guests. That made me curious. Could you tell us more about the soup aspect first? Yes, my mom would serve soup every Sunday. A lot of Reformed churches taught their congregants not to work on Sundays. Soup was something families could prepare the day before, and then they didn’t have to work much on Sunday. We would make a lot of soup on Saturdays. Did you eat a different soup each week? Usually it was the same soup: a Dutch vegetable soup with small beef meatballs in it. We made it using Knorr or Honig brand Groentesoep mix. The meatballs we made ourselves on Saturday—that was the most time-consuming part. 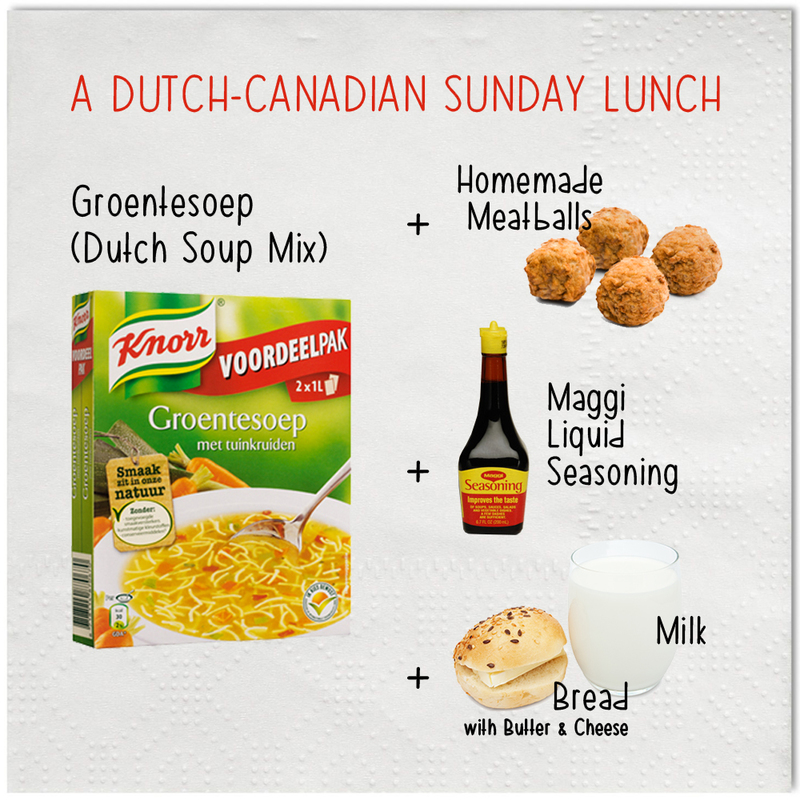 Oh, and Dutch people always add Maggi liquid seasoning to their soup—that liquid that looks like soya sauce. Oh, in the region of Germany where we live, apparently everyone eats Maggi. Except us! Yeah, that was guaranteed to be on the table. Also, traditionally Dutch people eat bread at two out of three meals each day. So the soup was always served with bread, butter and cheese. And we always drink milk with our soup. When your family prepared the soup, was the plan always to share it with guests? Yes, after church we virtually always had guests for lunch. Sometimes we had planned ahead of time who was coming, and sometimes it was spontaneous. But everyone knew not to expect a fancy meal. They already knew what would be on the menu, and the important thing was just spending time together. These insights about what Dutch people like to eat are helpful if someone is hosting a Dutch guest! How many people would join you for Sunday lunch? Well, there were six of us in our family and usually one other family with kids would join us. It was quite organized. Everyone ate together around the same table at the same time. There were probably 10-12 of us on an average Sunday, and the biggest group would be 15-20 people. If more than a dozen people were coming, Mom would make something extra instead of just soup, but it would never be fancy. The guests would stay a few hours. Do you know if this practice of serving soup to guests on Sunday was an idea that came from the Netherlands? I asked my mom about this, since I was so young when we emigrated. She said that in the Netherlands we would eat a fancier noon meal on Sundays. So, this was more a practice of our Dutch community on the Canada side. I know some people in central Alberta still have soup and guests each Sunday. I find it unique that your parents, who were new immigrants, were so quick to start having others into their home regularly. I wouldn’t have guessed that immigrants would be so hospitable from the start. Maybe I picture them having so much to adjust to that it doesn't occur to them to start hosting guests right away. Showing hospitality to others in their new community was an important part of their adjustment to Canada. They left their families behind in Europe and if anything, hospitality became more vital than ever. It created a support system for them, and provided connection and socialization in a new country. "Showing hospitality to others was an important part of my parents' adjustment to Canada. It created a support system for them." I should add that my parents were perhaps more hospitable than the average Dutch Canadian. Hospitality is definitely my mom’s gift. In our home, anyone was welcome at any time. If someone didn't have a place to go for Christmas, he or she spent the holiday with us. Some Dutch immigrants to Canada don't try to learn English and only made friends with people who speak Dutch. But my parents were good about making friends with and hosting guests of any background. We would play with our non-Dutch neighbours' kids and have them over. The Dutch Reformed church culture taught my parents hospitality, but they also practiced hospitality to personally live out their faith. How does the church you presently attend in the city compare to the one you grew up attending in the country, as far as hospitality goes? I go to a small church in the city, here in Alberta. It is not a Dutch Reformed church. The first Sunday that I visited there, the pastor and his wife had me over for lunch. I would say that their hospitality upon first meeting was definitely influential in my decision to attend there; I felt welcomed. However, in the past four or five years at my church, I’ve only been invited to someone’s house for a meal a handful of times. The church of my childhood was better at practicing hospitality. Would you say that your current church's hospitality culture (or lack thereof) is probably "normal" for Canadian churches at present? Yes, it seems like overall in Western culture we've gotten away from having people in our homes. If we meet, it's at a neutral location like a coffee shop. We feel we have to book appointments with each other and that we can’t just drop in. This is a loss, and our society is more disconnected because of it. I am a part of The Supper Club, which you featured in your first interview, and I love having meals with that group regularly. Yes, I lived overseas for nine years (in Australia, New Zealand and Africa) and I found that the days I missed my family the most were Sundays. There was something special about our Sunday traditions and I have so many good memories of those Sundays shared with family and friends. Through their regular hospitality, my parents taught me that anyone and everyone should feel welcome in my home. ...eating together is a long-held church tradition. ...Sunday is a day when we see others at church anyway. ...Sunday is a day when people often have spare time. ...it makes Sunday a distinct, fellowship-oriented day. ...it starts the week on a positive, encouraging note. We've also been thinking about how to turn our good intentions into actions. Here are a few things that are helping us make Sunday hospitality a reality more often than not. We're not making a lot of other Sunday plans. Reserving time on Sunday afternoons to give or receive hospitality is something that is possible when we we make it a priority. We try to limit how many recreational weekend getaways or activities that could be done at other times keep us from being regularly present with other believers on Sundays. We know that if we choose to spend every other weekend out of town, Sunday hospitality and fellowship won't happen much. Thankfully, neither of us have jobs that require Sunday hours, although we know that for some believers that poses a challenge to sharing Sunday meals. We're attending (and encouraging others to attend) the monthly Sunday potlucks at our fellowship. Our fellowship usually shares a meal together every first Sunday of the month and we do our best to be there. In the last few months, the potluck attendance was waning, and so we encouraged people to put reminders out ahead of time, and tried to take along a bit of extra food in case people forgot to bring something. We can encourage people who plan Sunday meals by attending and helping out. If your fellowship doesn't have a regular time to eat together, this might be something you could easily organize. We're trying to keep our Sunday hospitality simple. "When we keep the meal simple, having Sunday guests doesn't have to mean exhausting ourselves." This is something I have to constantly remind myself (especially in Europe, where our guests may be accustomed to fine cuisine): our guests aren't coming primarily for the food, they're coming to spend time with us. The food is secondary. If I come home from church and rush around frantically, Sundays will be stressful. When we keep the meal simple, having Sunday guests doesn't have to mean exhausting ourselves. We're trying to intentionally host people from our church whom we don't know very well. When making invitations, we try to think about who might be encouraged by a visit with us, not just whom we would have fun hosting. When we have the same guests over and over, it's easy for the conversation to move toward common hobbies or recreational topics, but adding a less-known person or two to the group (or hosting accquaintances on their own) can help keep the talk from turning to trivialities. Recently we had several guests that we didn't know very well, and we asked them to tell us the stories of how they came to know Jesus. Learning how God reached into their lives and rescued them was one of my favourite parts of the afternoon. We're not having guests every Sunday. It sounds funny to say that we're reclaiming Sundays for hospitality by not having guests every Sunday! But for us, every Sunday can't be a have-people-over Sunday. Some weeks are just too busy, and a long Sunday afternoon nap is in order. We're trying to make sharing Sunday lunch a rule rather than an exception, but sometimes we need a quiet Sunday to rest and reconnect to God and to each other in a way that isn't possible when we're serving guests. (Today was one such Sunday.) Not having guests every weekend affords us the energy to enthusiatically host guests when they do come. "Not having guests every weekend affords us the energy to enthusiatically host guests when they do come." Hosting guests always makes our Sundays more beneficial and constructive than they would have been otherwise. We feel more connected to our local fellowship and to the family of God. We hope you'll find the same thing, as you generously serve through Sunday hospitality. How are you reclaiming Sundays for hospitality? If you grew up in a church setting, you may have known people whose homes were regularly open to guests on Sundays. However, if you're still part of the church today, you've probably noticed that most of us fill our Sundays with—well—not hospitality. Once the formal gathering time is over, we shake a few hands and then we're off to shop, watch a movie at the theatre, take the kids to soccer, or catch up on housework. Lest you think I'm pointing fingers, I've done all of the same things on Sunday afternoons as well (except take my non-existent kids to soccer) and there's nothing morally wrong with such activities. But lately we've been asking ourselves if there is a better way to spend our time on Sundays. Paul wrote, "'I have the right to do anything,' you say—but not everything is beneficial. 'I have the right to do anything'—but not everything is constructive." Sure, we can do many things on Sunday. But for us, we're realizing that one of the most beneficial and constructive way to invest our Sundays is by giving and receiving Christian hospitality. Here are a few reasons why we think reclaiming hospitality on Sundays in particular is worthwhile. ...eating together has been a tradition of the church since its early days. Sunday is the day when we usually meet with our local fellowship. We currently live within walking distance of the hall where our fellowship meets, but others ride or drive 30 minutes or more to meet us there. Inviting people over after church is often more convenient and natural than asking them to come to our home another day of the week. I asked my husband to help me with this list and he stated the obvious: for many of us, Sunday is a day off, which means that most people have a bit more time to enjoy a meal together. Also, for those who are struggling with temptation, loneliness or anything else that seems to be accentuated when he or she has hours alone with no plans, being invited to spend time with believers on Sunday can be a lifeline. ...spiritual conversation comes up naturally on Sundays. When you've just heard teaching or sung good songs together, it's natural to steer the conversation in a spiritual direction. It can be as simple as asking, "Did you learn anything new in the message?" or "What is something you heard that will help you this week?" Recently a friend joined us for Sunday lunch, and within minutes of arriving he was telling my husband about the sermon at his church that morning. The words he and we had just heard set the tone for our afternoon together. The people in our German fellowship have faced many discouraging circumstances in the last year, and some Sundays our gathering is small. We haven't received a lot of invitations to Sunday lunch, and so we know that others probably haven't either. There are some kinds of ministry that we cannot have because German is not our native language, but inviting people over is something that doesn't take advanced German skills. Through sharing our Sunday afternoons, we can remind people that God is going with them into the new week, and that we are, too. Sunday hospitality encourages us and others. As I was preparing this post, I remembered these words from Rosaria Butterfield, one of my hospitality heroes. She says that Sunday is the perfect day to allow people into our lives, even uninvited. "Why do we make certain days ‘family days’? Sunday is the Lord’s Day. It is not ‘family day.’ It is the day for God’s people to be in each other’s lives without invitation." Those of us who are Christians belong to a family much wider than our blood families, and our homes should be open to that wider family. We're not Sunday hospitality heroes. Actually, we're just a few weeks into our goal of being more regular about Sunday hospitality in particular. I'm not sure how often we'll have guests on Sundays, but our goal is to make it happen more often than not, like the early church and many godly people before us. Articulating some of the reasons why hospitality is a worthwhile investment of our Sundays (which belong to God, after all) has been helpful to me. In the coming weeks I'm looking forward to sharing a few ideas about how to reclaim Sunday hospitality, with stories from people whose lives were changed—or are still being changed—through giving and receiving Sunday hospitality. But before we get to that, who will you have over this Sunday?